Ever wondered about the top 10 biggest advertisements ever? 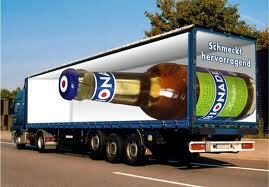 Advertisement have always been so important in providing a kick back to a company's well being in the market. Once advertisers concentrated on the quantity of advertisements employed. But now with the world becoming a global village, where a single incident could make or break a company's fortune in the worlds business, the race of hosting the largest advertisement wonders is still on fire. Such extraordinary efforts in the advertisement industry is to achieve that viral cause. The advertisement wonders that we are going to look in a moment have become viral and host companies are enjoying an ever ending flavor of this massive free advertisement. Betfair.com holds the record of the worlds 'largest advertisement hoarding' by Guinness Book of World Records. A massive field was created, to welcome the football players for Euro Cup 2008, over a time span of 4 months saying "No 1 For Football And Still Growing'. The advertisement was laid by 50,000 flowers that made up an each letter of 130 feet! 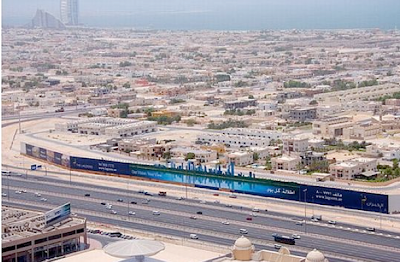 The area covered by the advertisement hoarding was about 50 football fields. KFC logo was build in desert Nevada, in a span of 6 days. Viewing such logos with Google Maps eye, is always fascinating. The logo was filled up with 65,000, 1 square feet tiles covering an area of 87,500 square feet. The bench mark was set in 2006 when KFC had a major logo change. The tycoon soft drink company, Coca Cola celebrated their 100th anniversary with laying down world's largest Coca Cola logo ever. The benchmark was set in Northern Chile Africa, featuring 70,000 empty Coca Cola bottles. Beneath the logo it said , 100 anos, meaning 100 years. The logo was 50m tall and 120m wide and was clearly visible with Google Maps eye. 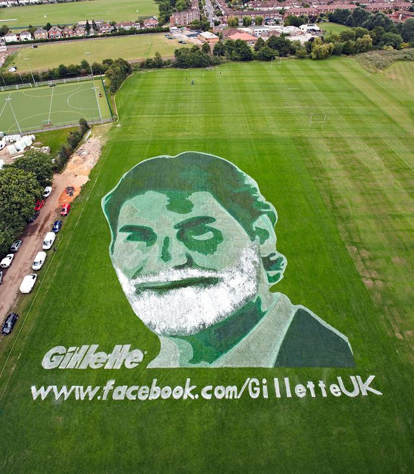 Street Advertisement Services in UK built up largest Gillette shave, where a huge Roger Federers face was painted onto a Rugby ground measuring 70m x 50m, for 2011 Wimbledon tournament. 3000 liters of paint and Industrial spay paints, were used to sketch the celebrity's face. Further 1000 liters of shaving foam was added to Rogers stubble, that was then shaved off with lawn movers to set the worlds largest Gillette Shave ever! With the 4 months of work, over an area of 100,00 square meters, Spring Barley was grown at Munich Airport to create the worlds largest Swissair Barely Crop Advert. 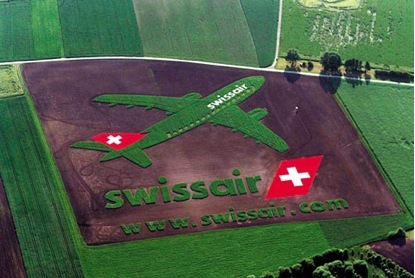 The crops together made out the name Swissair with the company website mentioned below. Dubai holds the record of hosting worlds largest billboard costing $3.2 million that runs over a distance of 1.5km. The adverts would be launched in 40 different countries and would take 12 months to complete the entire project. The adverts have been made with vented biodegradable recycled PCV, making the boards 100% friendly. The billboard will be funded by 100 sponsors, including 40 premier sponsors. 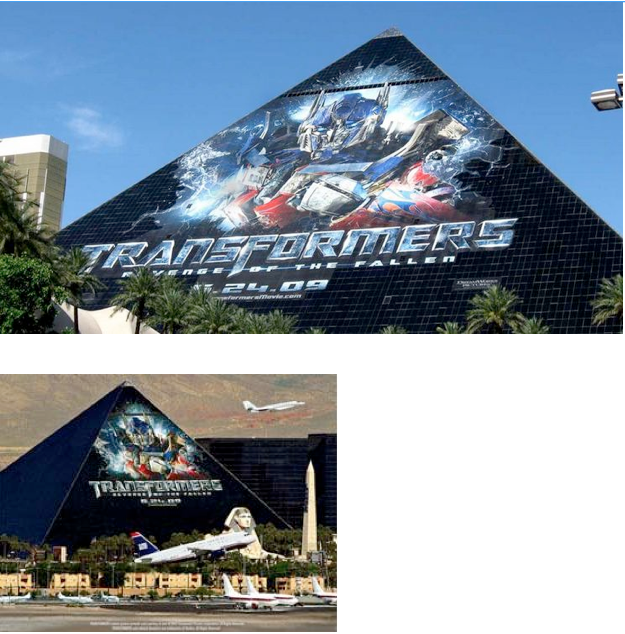 This particular example set the record for being the worlds largest building wrap. To promote the launch of the latest Transformer Movie, revenge of the fallen, nation wide, Luxor Las Vegas hotel was covered by the popular movie wrapper. The wrapper measures in 100,000 square feet covering the entire 500 feet hotel. Nationwide Insurance advertised a fictitious paint company, 'Coups's Paint' in Columbus U.S. 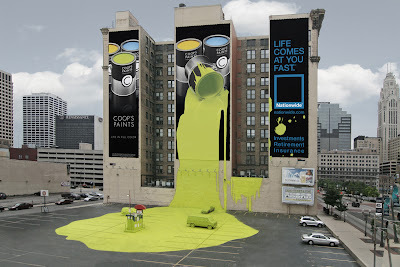 The building holds a huge banner with 3D paint spill effect over the parked cars near by. The ad covered an area of 400 square meters. 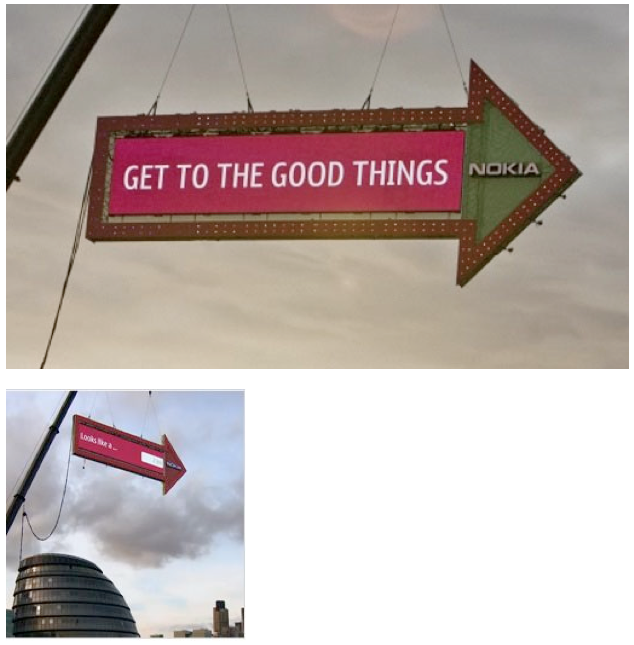 Nokia made the worlds largest road sign which weight over 2 tonnes and equal the size of 2 double Decker buses. Next to London Bridget, the arrow sign was hoisted 50m into the air. Nearby people could text their favorite location and that displayed on the arrow electronic screen. Arrow also pointed towards that location. Thanks for sharing this information and resources its really help full for me with the help of this we can improve our wordpress development and working. I really enjoyed all the advertisements. People just do amazing things to gain the popularity. The pain company aid was liked much to me.